RADEON Red Devil RX590 GPU PowerColor presents the AMD Radeon RX 590 GPU, operating with the latest 12nm manufacturing process, and substantial 2304 GCN-based stream processors. The RX 590 is designed and optimized for delivering a smooth performance and rapid gaming experience at high quality resolutions. 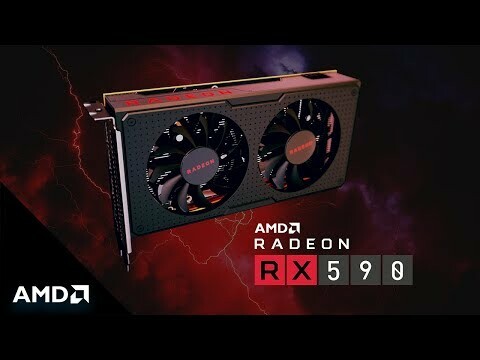 The Red Devil RX590 grips 8Gb of memory and runs off Polaris architecture that provides the perfect combination of low latency, smart software and powerful compute that enables a silky smooth virtual reality experience. 8GB PowerColor Radeon RX 590 Red Devil, 12nm, 2304 Streams, 1576MHz Boost, 8000MHz GDDR5, 3x DP/HDMI/DVI-D is rated 4.5 out of 5 by 4. Rated 5 out of 5 by ReeceN from Great 1080 Gaming Card! Plays most games tested on either the highest, or high settings at above 60FPS. Including: Resident Evil 2 The Division 2 Sea of Thieves Project Cars 2 Forza Horizon 4 Ring of Elysium Apex Legends Runs at around 60-70c on full load (for extended time). Reasonably low power consumption. Build quality use a solid metal housing and looks fantastic to me! Initially had an issue with Ubuntu booting to a black screen. However this was easily fixed by using the 'nomodeset' boot option. This is a great 1080 gaming card! Love it! Rated 3 out of 5 by scopio from Average for the above average gamer Just makes the above average graphics card with 8GB as default these days, in performance works very sufficiently in Full HD and Quad HD resolutions. I find it a somewhat difficult to position product, it is a really thick, yet short graphics card though is dual-slot based at just over 24 cm in length which depending on your motherboard it will cover more than 3 PCIe slots! You will need a PSU of 500Watt as minimum with 8+6pin PCIe connectors. Consumption under full gaming load it is definitely on the high side. Better than average as far as heat goes, makes use of thick heat pipes which lower the temperature and increase performance. The fans will not kick in until it is under heavy load when it is noisy. Pricey for what it is. Rated 5 out of 5 by Rob2101 from Super upgrade Picked this up on black Friday along with the rest of my upgrade, when I remove this from the packaging my first reaction was is this going to fit in my case. After that shock I looked at the quality and it is very well built. Performance wise this card is massive improvement over my old card. Cooling fans are quite when running at idle can't hear a thing comming fom them, only small down side was pointed out by my son when I had the card under hevy load the fans made a bit of a sqeaking noise but cannot hear it if you use headphones.